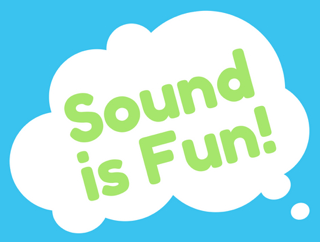 Books for toddlers about sound ~ SOUND IS FUN! There’s a lot of concepts that relate to sound that toddlers can understand like loud and quiet, animal sounds, or ears are for listening. Sounds can make a book more fun and hold a toddler’s attention for a bit longer. This book is about situations that call for a quiet voice such as “swimming underwater quiet” and sleeping sister quiet.” The graphics are cute, detailed, and not too bright. This would be a great book for settling down before bed or nap. The Loud Book is the same author as the Quiet Book except it’s all loud sounds (“Thunderstorm Loud” or “Candy Wrapper Loud!”). It’s a good way to describe how different situations and sounds can all be loud. It’s a quick read that would be good for story time – either with The Quiet Book or on its own. Each page has a quiet and loud example like “crayons are quiet” and “pots and pans are LOUD.” It’s playful, humorous, and colorful. This book has a Spanish edition, as well. This book is a classic and is part of the Bright & Early Board Books(TM) series. The look and feel is similar to Dr. Seuss and Perkins’ books are often apart of Dr. Seuss collections (including The Ear Book). It’s full of environmental sounds which are great for encouraging toddlers to talk. A young girl goes on a walk with her dad and her dog, Major. She calls it a Listening Walk and talks about all the sounds she hears. She says, “On a Listening Walk I do not talk. I listen to all the different sounds. I hear many different sounds when I do not talk.” It’s a perfect activity for little ones, too, who can go on their own Listening Walk. For ages 3-7. This book covers all the sounds in a neighborhood from a squeaky door, a noisy mouse, and instruments like drums and a trumpet. Marsalis is a world-famous trumpet player and this book blends his upbringing in New Orleans with his life as a musician. Most of the book is environmental sounds which are great for encouraging toddlers to speak.